The life of a writer is pretty dull. That is almost a necessity. You can’t write a novel without spending a lot of time on your own and it is best if your daily life is not too exciting or distracting. It’s not only that you have to spend a lot of time alone in a room in front of a computer, there is also the time needed for mulling things over, for wandering around the house, and staring into space. Your family come to realise that though you are there in body, you are not necessarily there in mind. But now and again, the time comes to rummage in the wardrobe for your glad rags, spray on some of that Chanel No 5 that your husband once gave you for Christmas, and head for the bright lights of Bristol. 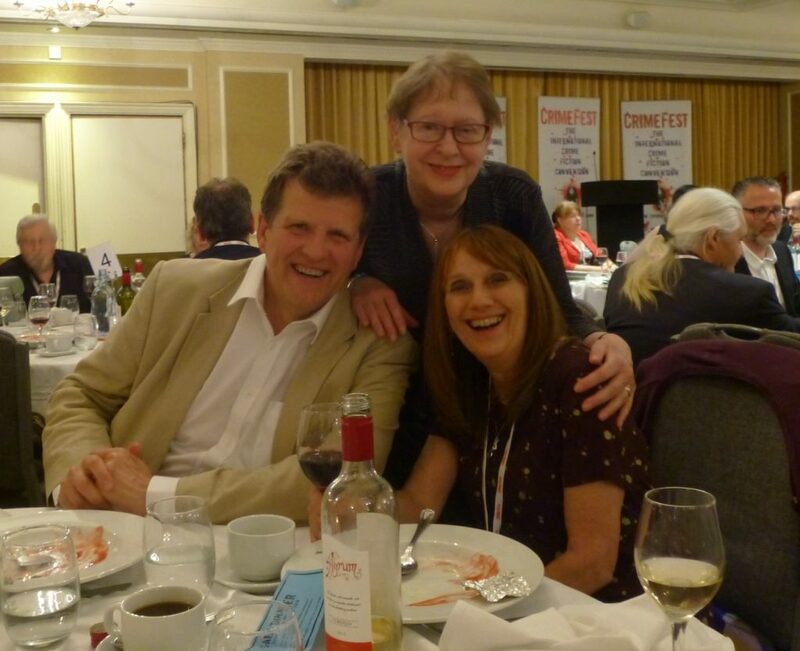 Yes, last week-end it was Crimefest, one of the highlights – if not the highlight – of the crime writer’s social calendar, and this time it was especially exciting because I had a story short-listed for the Margery Allingham Prize. The winner was announced at the Friday evening reception. To cut the suspense short (not something I usually like to do) I didn’t win. But any disappointment I felt was rapidly assuaged when the next announcement was the long list for the CWA Short Story Dagger – and my story, ‘Accounting for Murder’ was on it. That was about as much excitement I can take in one evening. I had a lovely time, meeting old friends and new, but I am quite happy to back at home now in my study, just me and the cat. And happy too to return to my usual occupation of getting people into terrible trouble and telling lies for fun and profit (as Lawrence Block has it). The photo is of me with friends, Kate Ellis and Jason Monaghan, and was taken by Dea Parkin.